Is it the end of June already? At least it ended on a Friday and we can close out DevCentral’s Cloud Month followed by the weekend! First, huge thanks to our Cloud Month authors: Suzanne, Hitesh, Greg, Marty and Lori. Each delivered an informative series (23 articles in all!) from their area of expertise and the DevCentral team appreciates their involvement. We hope you enjoyed the content as much as we enjoyed putting it together. 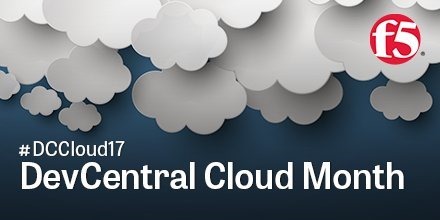 And with that, that’s a wrap for DevCentral Cloud Month. You can check out the original day-by-day calendar and below is each of the series if you missed anything. Thanks for coming by and we’ll see you in the community. What’s Happening Inside My Kubernetes Cluster? Flashback Friday: Is Vertical Scalability Still Your Problem?